This simple tool has a thin wall nut driver on each end and stripping notches on the handle. The nut drivers open all common telephone boxes. It will also position the mounting rails in Hubbell full size and wall mount cabinets and key the REBOX door. The cable strip blades can be used for both telephone and electrical wiring. 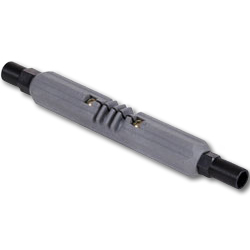 2 - Nut driver, sizes: 3/8" and 7/16"
Slim profile; overall length: 7 7/8"